One of my favorite things about my friend Julie is her fearlessness. This applies to her cooking and baking too, and I’m always learning something new from her. 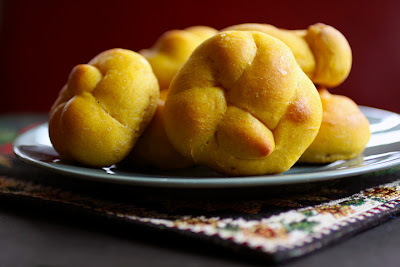 Like how to make these knot style squash rolls. Julie substituted squash from her garden for this recipe, which gave them a beautiful orange hue. You can also make them with roasted and mashed sweet potatoes if you prefer. Or canned pumpkin works too I suppose, as the recipe instructs us to do! This pretty recipe comes from the Taste of Home website. In a bowl, dissolve yeast in warm milk. Add the butter, sugar, pumpkin, 2 eggs, salt and 3 cups flour. Beat until smooth. Stir in enough remaining flour to form a soft dough. Turn onto a lightly floured surface; knead until smooth and elastic, about 6-8 minutes. Place in a greased bowl, turning once to grease top. Cover and let rise in a warm place until doubled, about 1 hour. Punch dough down. Turn onto a lightly floured surface; divide in half. Shape each portion into 12 balls. Roll each ball into a 10-in. rope; tie into a knot and tuck ends under on each side. minutes. In a small bowl, beat water and remaining egg. Brush over rolls. Bake at 350° for 15-17 minutes or until golden brown. Remove from pans to wire racks. 24 Servings Prep: 30 min. + rising Bake: 15 min. Recipe from Taste of Home 2010 submitted by Dianna Shimizu Issaquah, Washington. Rolls made by Julie Hopper. Picture by Laura Flowers. Wow, these sound great! I don't think I've ever heard of a pumpkin dinner roll but I would definitely give it a try! Great color and lighting, not to mention the lovely pumpkin flavor. Happy Thanksgiving week :). Lol they do V! Julie is awesome. have you ever made pumpkin waffles? i have a FAB recipe if you want one. I'm trying to decide if I'm going to make homemade rolls for Thanksgiving and thinking we would make for something fun and different. Happy Thanksgiving!! Shar yes!!! I'd love a good pumpkin waffle recipe. I went to your blog, but can't figure out how to comment so I'm heading to your FB. Those look gorgeous! WOW! Your pictures always make me drool! Perfect timing! I've actually been searching for a pumpkin roll recipe to make for tomorrow. And these look, well, ideal in every way. These look wonderful, what a treat for a holiday dinner. Laura, these pumpkin rolls are so much fun. I have some left over baked sweet potatoes that I need to use up and I think these rolls would be nice with soup or salad for a beautiful Fall dinner. Could these look any more appetizing? I think not! I love adding pumpkin/squash to my bread recipes. Not only do you get great color, but it also makes your bread so moist! Thank you for sharing. I hope you have a great holiday weekend! this looks so amazing! i know my husband would love this. thanks for sharing this. and enjoy your thanksgiving weekend. These look fantastic. I want to bite into one immediately. I just made a batch with a delicata squash I had left over from the fall. They're still warm. Best rolls ever. Steph you are too cool!! How many students make their own rolls, let alone squash rolls? I'll be on campus starting this summer. I hope I see you around! 1 package of yeast is 1/4 oz. not 1.4, not a big deal but your recipe was refereed by someone else who called it 2 oz. I made them and they tasted very beery, it was a bummer because they look so good.